High uric acid levels can result in a painful condition known as gout. Avoiding foods high in uric acid can help prevent the occurrence of this painful condition. While purine is important to the body, recycling process of cells causes the breaking down of purines. This produces a chemical byproduct known as uric acid. While it is normal for the body to produce uric acids in acceptable levels, high levels will cause a build up that is detrimental to health. Uric acid, normally, dissolves in the blood and travels to the kidneys to be flushed out through urine. However, when the body produces excessive amounts of uric acid or does not flush out the uric acid properly, it can result in a condition known as hyperuricemia. This can cause various health problems, including the development of a painful joint disease known as gout. A build up of uric acid is often attributed to a diet high in purines, so you'd better control the intake of high uric acid foods listed below. Various factors contribute to the excessive development of uric acid in the blood. These can range from obesity to kidney problems to diuretic or immunosuppressant use. However, various foods too can contribute to the excessive formation of uric acid in the blood. If you suffer from gout, knowing the foods that contain high levels of purines can help you prevent a gout attack better. Meat - Out of all foods that are high in purines, meat is ranked the highest. Organ meats, such as liver, heart, kidney and brain, contain the most amount of purines. If you suffer with gout, you should completely avoid the consumption of organ meats and red meats, such as beef and pork. Bacon contains high levels of purine, and, therefore, should be strictly avoided. Poultry, such as, chicken and turkey can be consumed only in moderation. Seafood - Seafood should be avoided as this too contains high purine levels. Shellfish such as crab, lobster, and shrimp, sardines, tuna, mackerel, herring, halibut and salmon are some seafood that contains high purine levels. Vegetables - Although certain vegetables are high in purines, making them on the list of high uric acid foods, they are not as high as that in organ meats and seafood. However, avoiding them or using them in moderation can be beneficial in keeping gout attacks at bay. Some vegetables with high purines are mushrooms, black gram, beans, peas, lentils, broccoli, cauliflower, carrots, aubergine and spinach. Yeast - Any food item that contains yeast should be avoided as this too contains high purine levels. Various alcoholic beverages especially beer and breads contain excessively high amounts of purines. 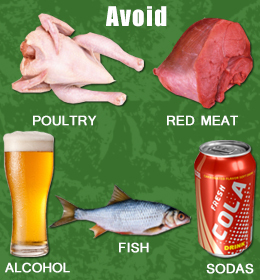 Gout patients should avoid these completely to prevent attacks of gout. Fruits - There are also a number of fruits high in purines. These include dried fruits such as dates and figs, and fresh fruits such as bananas, avocado, apples, kiwi fruit, gooseberry and pineapple, etc. There are two methods that can be used to lower uric acid levels in the body, through the avoidance of foods that contain purines and medication. Increasing carbohydrate foods and fruits that contain high water content is beneficial in preventing gout. Just like there are uric acid foods, there are also some foods that can help lower uric acid level, like berry, apple, celery seed, green tea, olive oil, etc. Try to decrease your soda consumption and alcohol. And maintain a healthy body weight to prevent an increase in uric acid levels. While your diet can make a significant impact in maintaining proper levels of uric acid, a doctor may also prescribe you with medications. With proper diet management and medications, you will be in better control of your gout attacks.